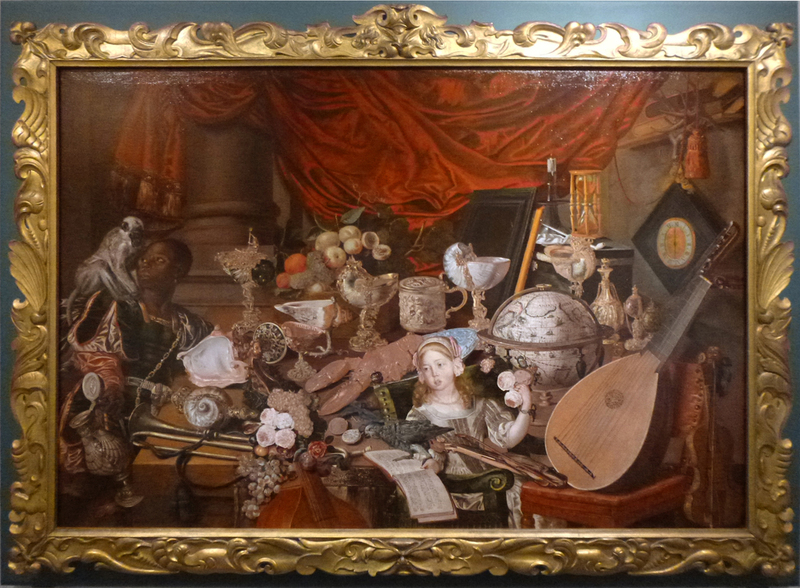 The Paston Treasure is an extraordinary still life – an assemblage of rare and precious items from four continents, which were collected by the eponymous Paston family , and were recorded in this painting, commissioned in the 17th century by Sir Robert Paston (1631-83). It was probably painted by a peripatetic artist from the Netherlands, who was travelling though Norfolk (there was a very busy trade route between East Anglia and the Low Countries from an early point, as wool was sold from Norfolk and Suffolk to the weavers, dyers and clothmakers across the North Sea, and bought back as fabric). He has been tentatively identified as Franciscus Gysbrechts, and latterly as Pieter Gerritsz. van Roestraten (c.1630-1700), a pupil and the son-in-law of Frans Hals, who is recorded in London from about 1660 . 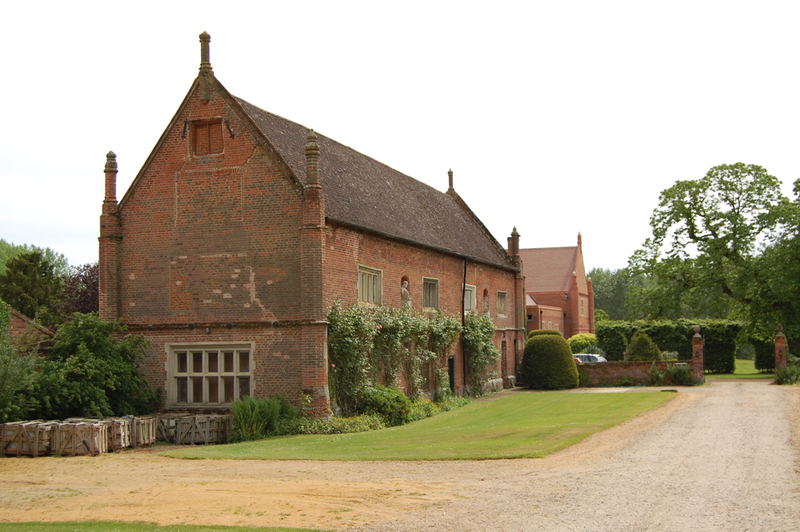 The collection had been assembled mainly by Sir Robert and his father, Sir William Paston of Oxnead (c.1610-62/63). Sir William was Sheriff of Norfolk from 1636-37, but had also travelled quite widely in Europe and in the near East; his son was a traveller too, in Europe, and together they built up what has been described as ‘a world of curiosities and some very rich ones, as cabinets and juells’ . They created their own wunderkammer – a cabinet of curiosities which would express in miniature the marvels of the natural, scientific and artistic worlds, and would display their taste and learning to friends and acquaintances. This was housed at Oxnead Hall in Norfolk, a large and handsome mansion built in the reign of Elizabeth and updated by Sir William in contemporary Caroline style. Unfortunately, the Pastons overreached themselves by extending their handsome house to palatial dimensions, and then by entertaining Charles II in it, both of which severely dented the family fortunes. This setback was repeated when Robert became Lord Lieutenant of Norfolk in 1676, a ruinously expensive position; he was created 1st Earl of Yarmouth in 1679, but by then the family was already beginning to sink into debt . Robert’s son, the 2nd Earl and another William, was predeceased by his sons and other male heirs: he died old and impoverished in 1732, the infant title became extinct, and a hundred years after the remodelling, Oxnead had to be sold. 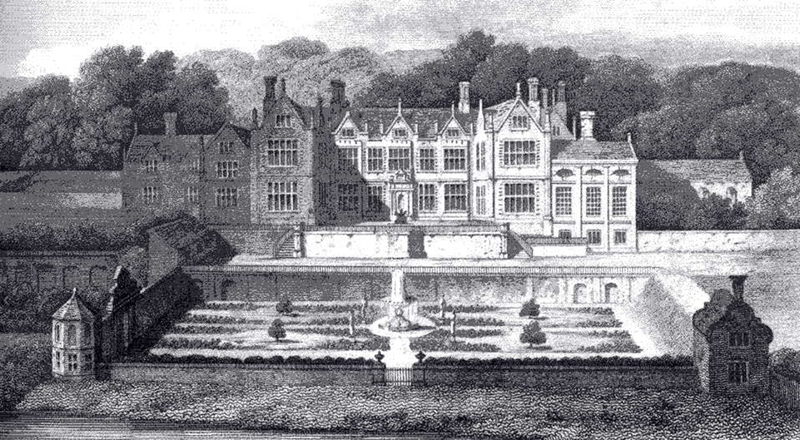 Shortly afterwards it was demolished, save for the kitchen wing (the long, outlying wing on the right in the engraving). The cabinet of curiosities was sold, and scattered to the four winds. 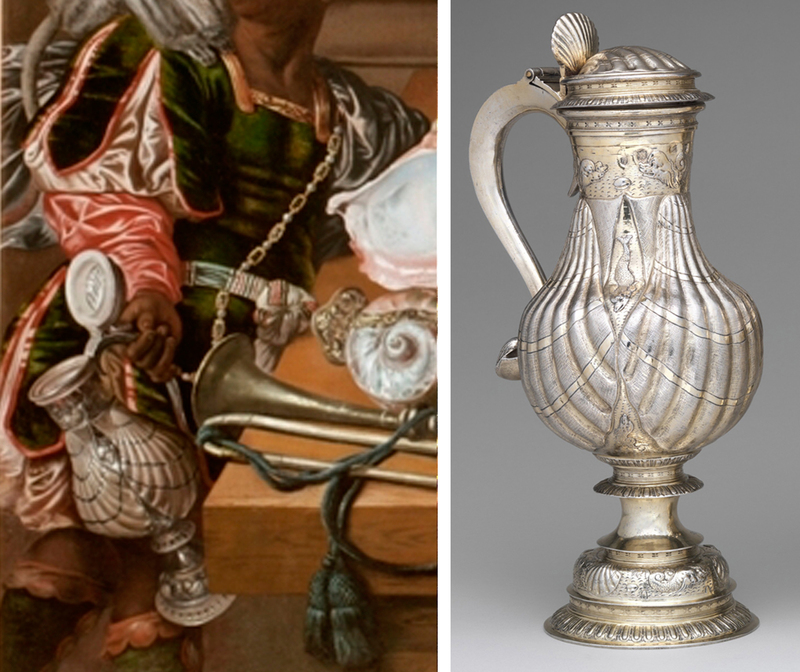 Its contents can be seen in museums across the world: for example, there is a pair of silver-gilt flagons now in the Metropolitan Museum, New York, one of which is held by the coloured servant on the left of the painting. The decoration is based on scallop shells, which clasp the body of the vessel, and ornament the lid and the foot; this fishy motif is reinforced by the finely-chased dolphins and other marine creatures on the collar, foot and reposes. 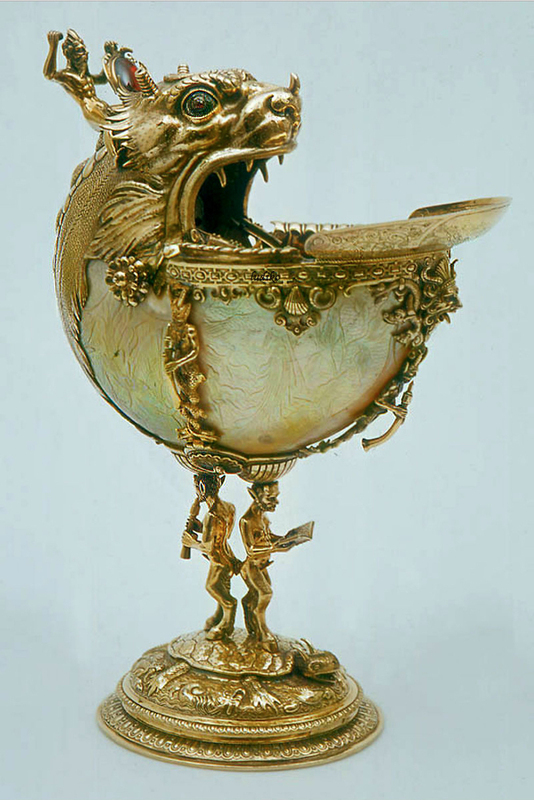 Silver-gilt flagon, detail of The Paston Treasure; & displayed in the Metropolitan Museum. 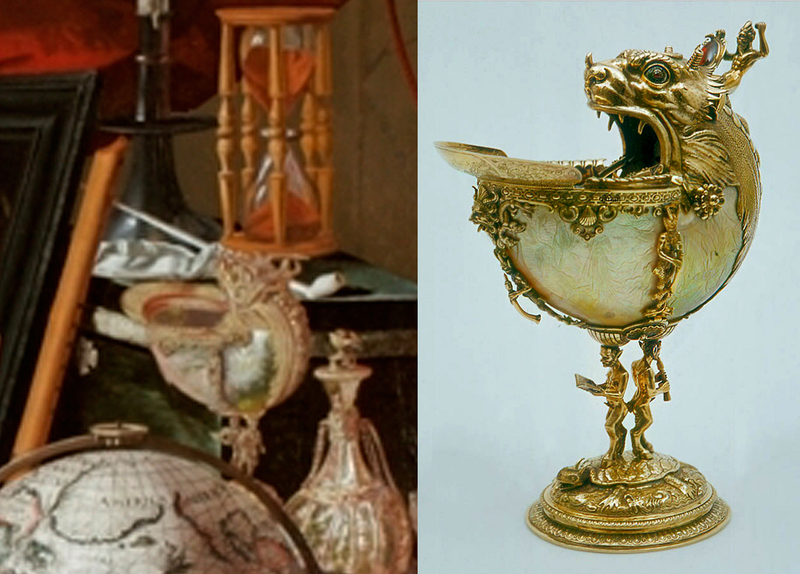 These flagons were made in London, but many of the other precious objects in The Paston Treasure came from the Netherlands or Germany: for instance, the mounted nautilus shell on the right side of the painting, between the hourglass and the globe. This is now in the Prinsenhof Museum in Delft, having returned to the town of its birth. It was made by a Flemish goldsmith: one of those who, from the 1580s onwards, settled in Holland – Delft being a magnet of prosperity, principally because of its flourishing brewing industry. Marine motifs were popular in the Low Countries, with their sea-going bias, and became an important component of Mannerist design in the late 16th and 17th centuries; the ornamentation of the mount reflects this, with its snarling sea monster steered by a tiny figure of Poseidon, and its foot moulded with fish. The lip of the cup is decorated with scenes of Jonah on a ship and with the whale . Mounted shells seem to have been a particular love of the Pastons; the painting contains eight examples, as well as mounted ostrich eggs. 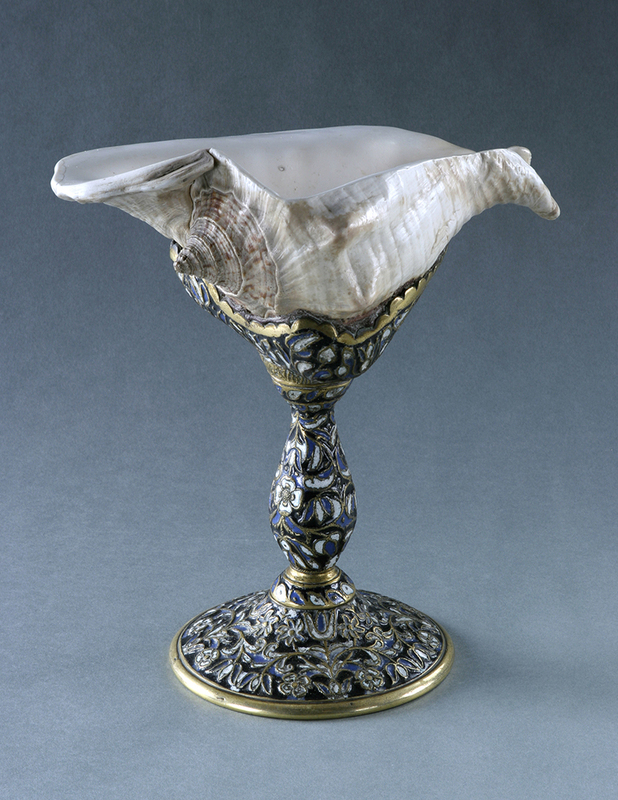 One item from the collection remains in Norwich Castle Museum: this is a strombus shell mounted as a cup on a decorative enamelled foot. It appears in the picture lying on its side on the extreme left hand edge of the table, in front of the servant’s left shoulder. The pearly pink sheen of the painted shell indicates that this original specimen was probably broken at some later point, and a new shell was mounted on the foot. Apart from these strange, rich, and beautifully-crafted examples of the goldsmith’s art, The Paston Treasure contains, for example, a globe by Willem Janszoon Blaeu of Amsterdam (1571-1638) . Blaeu had studied for two years under the astronomer Tycho Brahe, before founding a workshop in his native Holland selling maps, mathematical instruments and globes. The latter were usually sold in pairs comprising a terrestrial and a celestial globe; here, in the painting, the presence of the former points to the travels of the Pastons, father and son, and to their consequent sophistication and knowledge (literally) of the world. The actual fruits of this knowledge orbit the globe in tangible form: not only the gold and silver items, but living things – the coloured servant, the monkey, the parrot, the peaches, grapes, orange and lemon. Then there is a number of musical instruments of various kinds – a trumpet, lute and violin, amongst others, again denoting a knowledge of the arts and a social refinement. At this point, the various pieces of the still life begin to edge into metaphor and allegory, as the symbolic meaning they convey is overlaid on the pure representational aspect of the painting. Musical instruments, for instance, indicate a sense of harmony and rationality, and perhaps the idea that the wealth and sensibilities which have garnered such an apparently chaotic welter of objects can arrange them, like a tune or a dance, into a coherent and creative pattern, and through them impose order and reason back onto the anarchic universe which produced them. But beyond this metaphor again is a more potent and tragic theme. In front and almost at the centre of the still life sits a little girl. She is assumed to be Mary, the daughter of Robert Paston who commissioned this painting; she died from smallpox in 1676. She holds a spray of roses; more lie on the table, whilst behind her, in the background to the left of the composition, a guttered candle, an hourglass and a clock are grouped, ominously. 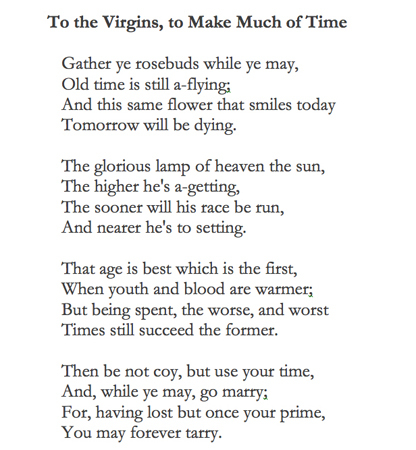 In 1648 Robert Herrick had published a number of his poems in the volume Hesperides, one of the most famous of these encapsulating the principle of carpe diem, with which – as it was popularized in an ode by Horace – the educated Pastons would have been more than familiar. Herrick’s poetry was a slow burning work, and it is uncertain how well-known (if at all) this particular poem would have been when he died in 1674, two years before Mary Paston. But it sums up, in its first two verses particularly, the spirit of the age – that enhanced sense of transience which the upheaval of the Civil War and the execution of a king had given to the country. The Pastons had entertained the heir of that dead king; they had reached the social eminence of an earldom and a great house; Robert had had six sons and three daughters; but life was tenuous and uncertain – debt hovered, and this little daughter died. 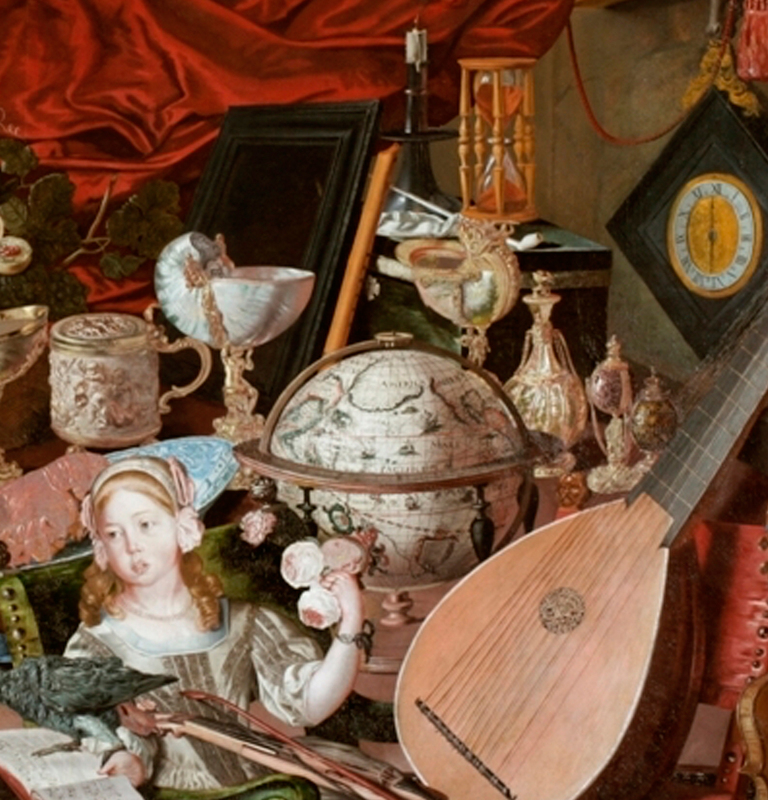 The Paston Treasure, as well as a marvellous still life and a celebration of the world’s riches, is a meditation on change, ephemerality and death. It is what Netherlandish painters do so well, a vanitas: ‘this same flower that smiles today/ tomorrow will be dying’. Time has had its way with the physical picture, too. Once very dark and obscured, the painting has recently been conserved, and attention has now turned to the frame. This is because Norwich Castle Museum, in association with the Yale Center for British Art, is planning to exhibit as many of the objects in The Paston Treasure as can be reassembled. The exhibition will take place in 2018, and the painting will of course be the fulcrum of the whole display. Although the latter has been cleaned, nothing has yet been done for the frame, which has suffered sadly over the centuries. The original gilded finish was in such condition that, by the time the Museum acquired the work in the 1940s, it was necessary to remove the gesso layer along with the remains of the gilding in order not to distract attention from the painting, so it is now clean, bare pinewood, giving it a rather anachronistic air. It is almost certainly the original setting: a late Auricular frame contemporary with the painting, still fashionable in the 1670s and early 1680s. This style is related to Mannerist frames fashionable on the Continent; it grew out of the shallow, scrolling gilded British frames of the 1630s which were an assimilation of the Italian ‘Sansovino’ style, and of the fluid, organic ornamentation of ‘leatherwork’ frames. The influence here is the outline of an animal skin, prepared for transforming into vellum: the scrolls and folds along the top and bottom rail mimicking the curling edges of a skin stretching out from the head of the beast. On the Paston frame the head at the crest is a lion’s, with a realistic hairy mane scrolling down around its threatening brow; it recalls the skin worn by Heracles after he had killed the Nemean lion (below). 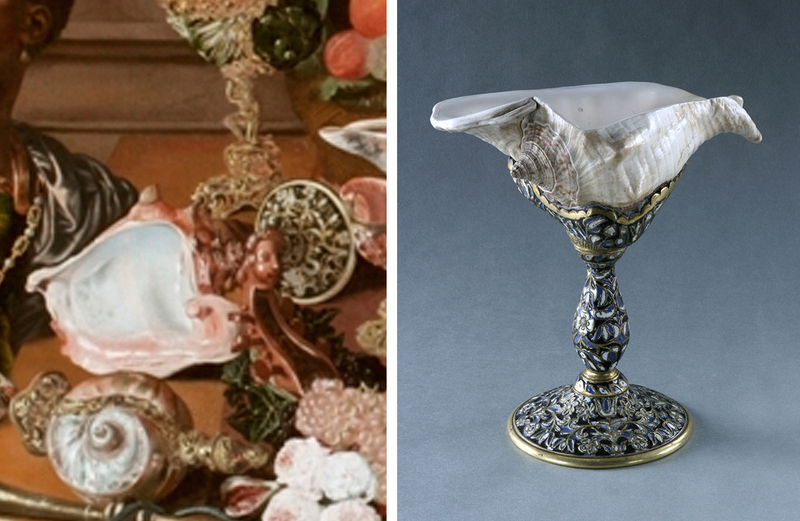 Auricular frames were influenced by silverwork, sculpture, and engraved, printed portrait ‘frames’; they employ marine forms, such as the segmental worms or spiral shells visible in the detail above. This image also shows tied corner trefoils, which derive from the Sansovinesque pattern. On the bottom rail the lion mask is balanced by the mascaron of a ‘Green Man’, evoked from layered leaves and eared like an owl. 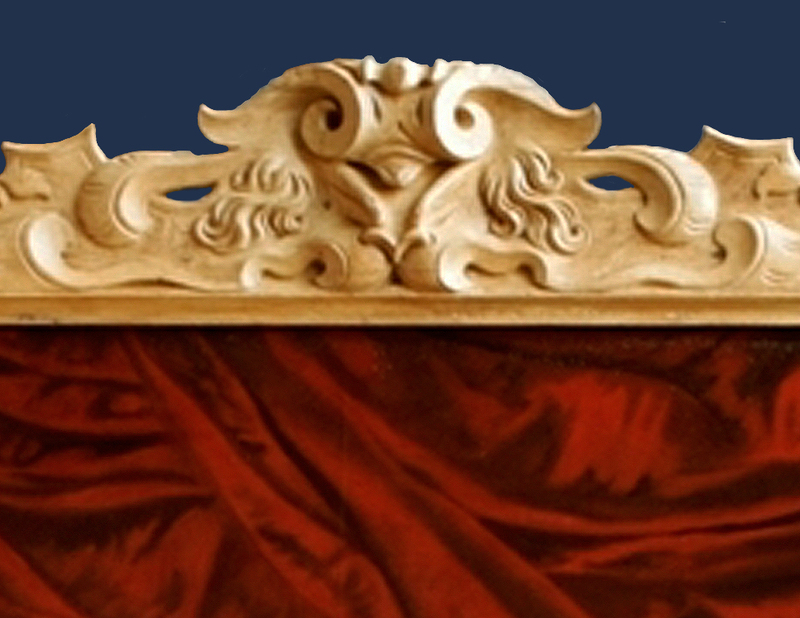 The unusual and idiosyncratic features of this frame are the flaring forms of wings and elongated scallop shells at the centre and top of the lateral rails. This is an unusual interpretation of the Auricular British frame, and may have been made by a local carver. The frame would originally have been gilded all over on a smooth gesso base, creating an effect like ripplinging ormolu or molten gold – an appropriate setting for a work which depicts so many precious golden objects. It needs this golden finish to define more clearly the transitional, decorative boundary between the real world of the spectator and the lost, idealized world of the painting. It needs to be gilded to restore its historical integrity; and it needs it especially in order to be transformed as the centrepiece of a unique exhibition, examining the creation and representation of a British kunstkammer. But restorations of this order aren’t cheap: the painting is 5 ½ feet tall and over 8 feet across (165 x 246.5 cm), and the frame is sufficiently intricate to absorb a great deal of labour and craftsmanship – never mind the books and books of gold leaf. This is why Norwich Castle, with the help of the Art Fund, launched a crowdfunding appeal to transform this unique frame into the jewel-like setting an extraordinary painting deserves. At the end of March 2015 the target was reached, and the frame was sent off to be regilded. 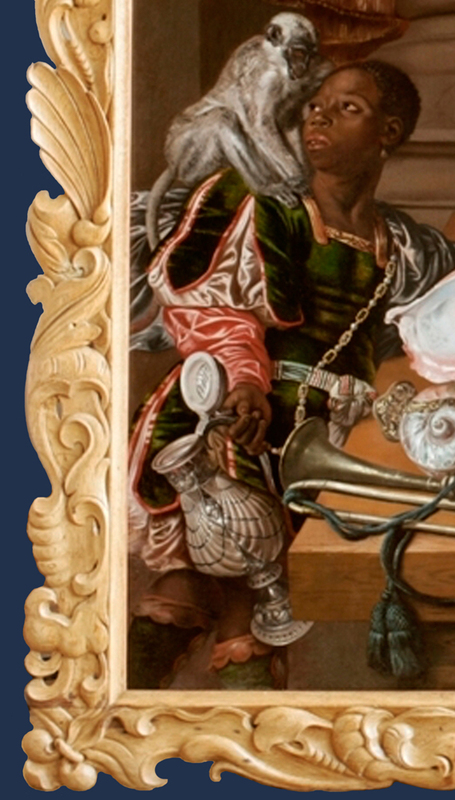 The craftsman chosen for this delicate task was Michael Hilliard, a craftsman of Huguenot descent, who reproduced the painstaking processes of sanding, gessoing, gilding and patinating the frame, just as the original gilder would have proceeded. 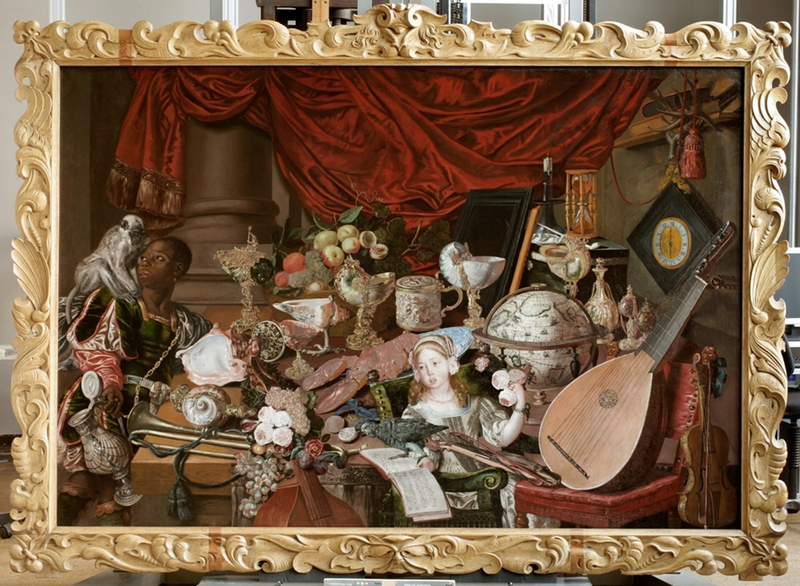 In October the finished object was unveiled at Norwich Castle; it is a triumphantly successful restoration, which allows the frame to melt back into its place as a subtle ornamental border around the painting, binding it to the interior where it hangs, leading the eye into the composition, and gently echoing the curving lines and reflecting surfaces of The Paston Treasure. See Jean Agnew (ed. ), ‘The whirlpool of misadventures’: Letters of Robert Paston, 1st Earl of Yarmouth, 1663-79, 2012. 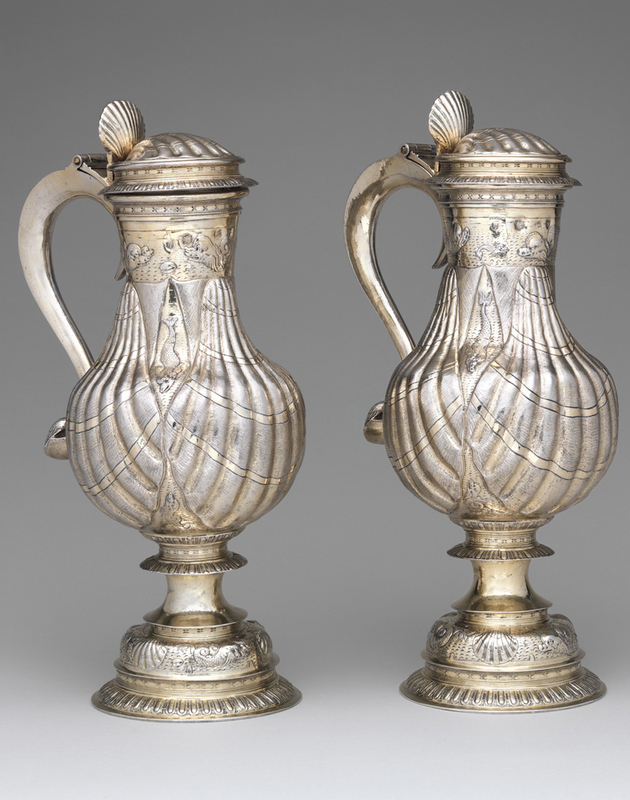 See Axel Ruger, ‘Silver and silver gilt’, Vermeer and the Delft School, 2013, Metropolitan Museum of Art, no. 143, p. 526. Thank you for this! I want to note that the instrument I think you are referring to as a mandolin is a lute. Also, I see the top of what looks like a viola da Gamba without its neck. I hope that you enjoyed the non-musical bits of the article – I’m afraid that my knowledge of 17th century instruments is very sketchy, and I apologize for getting it wrong. Thank you for pointing it out; you win the prize for observation, as this piece was published over three years ago, and nobody else seems to have noticed! I enjoyed the post very very much. 🙂 It is a fascinating painting, as is the family history. Sorry for belated response – and thank you for such a nice comment. It is indeed a fascinating painting, and looks very good in that frame. I hope that you may be able to get to the exhibition, which continues till 23 September 2018.